There are probably some translation issues with this story, but so be it. According to Arabic news sources, which I of course read diligently, a family in Mahd al Dhahab, in western Saudi Arabia near Medina, filed a lawsuit in a local court alleging that they are being harassed by a genie. The English-language Khaleej Times reported that the family has lived in the house for 15 years, but only recently "began to feel the presence of genie." The Arabic word involved is something like djinni, which probably explains how that quote was translated, but I like it the way it is and am going to start using it all the time. "What's wrong? You look like you just felt the presence of genie." Or, "This stuff is great, man. 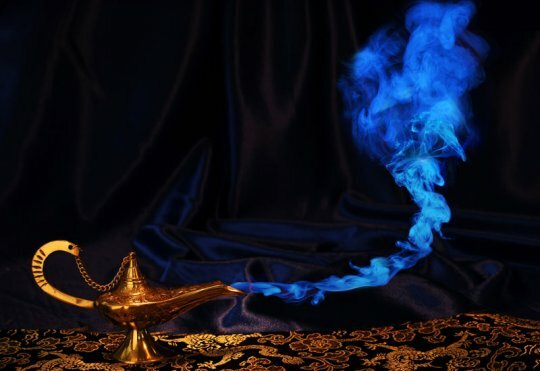 You will totally feel the presence of genie." Anyway, feeling the presence of genie was not a happy experience for this family. The head of the family (they requested anonymity) said they had begun to hear strange sounds, including angry voices on their cellphones; that things started to disappear from their home; and that family members were pelted with stones if they went out at night. Around here I'd suspect an ex-girlfriend, but clearly there are even more evil forces at work in Arabia. Oddly, this genie seems to be fond of cellphones. According to the report, "[t]he lawsuit accuses the genie of stealing mobile phones, and sending threatening voice messages through cell-phones to vacate the house." There may be two of the harassing spirits, according to the head of the household, who took at least one of the calls: "A woman spoke to me first, and then a man. They said we should get out of the house." Hm. Are you behind on your mortgage payments, maybe? Just thinking out loud. Whether this actually involves a "lawsuit" of the kind we are familiar with is not clear — I suppose it is probably more about asking the authorities for help than, say, seeking an injunction to get the genie to cut it out. (The sources used the terms "lawsuit" and "complaint," and that's close enough for Lowering the Bar, as far as I'm concerned.) In any event, Sheikh Amr al Salmi, head of the local sharia court, said they would do their best. "We have to look into this case and verify its truthfulness," he said, "despite the difficulty of its consideration." He said the family had moved out of the house until the genie or genies could be dealt with. The Wikipedia article on sharia law has an interesting discussion of the theory that English common law and even the U.S. Constitution may have incorporated ideas that originated in Islamic law, which the Normans might have learned about while they were still kicking around the Mediterranean, before they got bored and decided to conquer England. As for the Constitution, some have pointed out that Thomas Jefferson owned a copy of the Koran and was familiar with certain writings on Islam, and that he also owned some African Muslim slaves. With whom he was also familiar.